Bil-Jac Dog Food Reviews: Is It Worth Your Money? Home Product Reviews Bil-Jac Dog Food Reviews: Are They Worth Your Money? With the ever-growing size of the pet industry, competition is no doubt tough. Brands with little financial muscle, therefore, stand a smaller chance to be as popular as those ready to dish out millions of dollars on marketing. You’ve probably not heard of Bil-Jac yet, but given their rising popularity worldwide, you may not want to miss a chance to know what they are all about. Besides, what they offer might just be what you’ve been looking to get for your dog. For over 65 years, Bil-Jac, a family owned and operated company, has consistently made pet foods complete with all the nutrients that the ancestors of your special friend needed for survival and to stay healthy. Use of the Nutri-Lock system (more about it later) plus the addition of high-quality proteins, carbs, and natural fat-sources to their formulas sets Bil-Jac apart from their competitors. In my review, I tell you more about what the brand offers, what makes them special, plus a review of the best Bil-Jac dog food. Bil-Jac makes both dry and wet foods, in addition to a variety of treats and supplements for dogs. They have diets designed for puppies, adults, and senior dogs; small, medium, and large breeds; as well as those pups with special health needs such as weight management. One particular product line I found irresistibly great is the frozen fresh meat-based treats and dog foods, some of which can be served straight away after you’ve thawed them. Is Bil-Jac A Good Dog Food? You’ve probably seen how Bil-Jac describes their pet foods–that they are super-premium diets ready to offer your pup great nutrition and irresistible taste. Well, let’s find out. One of their major selling points is that, compared to other brands, they formulate their dog food with relatively more real chicken plus real chicken organ meat (at least 12 pounds for every 15 pounds of dog food). That’s true, and pretty great if you ask me. Regarding the carbs, the company says they aren’t used as substitutes for proteins but rather to simply provide energy and make the diet balanced. Another interesting thing to note is that Bil-Jac formulas contain no extra fat and they are formulated in a way that makes them hypoallergenic. Well, whether that claim is true or not is a decision left to us pet dads and moms. After examining some Bil-Jac reviews, I noted that use of ingredients such as cornmeal and brewer’s yeast doesn’t seem to sit well with a good number of customers, given the claim by some experts that the former is simply a cheap filler while the latter is a potential allergen. My suggestion regarding this is to make sure you’ve carefully examined the ingredient list just to be sure everything included in the formula is right for your pup. Regarding recalls, in 2012, the brand issued a recall (voluntary) of one of its adult dry dog foods, citing potential mold contamination. This was after some pet parents raised complaints about the existence of molds in a few of their formulas. Other than that, there are a dozen more pet parents who agree that Bil-Jac makes better nutritious diets and that their Nutri-Lock system is a welcome approach because our special friends seem to be getting all the nutrients their bodies need to stay completely healthy. Bil-Jac actually has exclusive use of the Nutri-Lock slow-cook method which helps to protect key nutrients in the main ingredients by gently dehydrating and pasteurizing them at a controlled temperature. Thus, the company’s pet foods end up having relatively more key ingredients and nutritional content than their competitors. Now that you know what Bil-Jac dog foods are all about and what makes them special, let’s have a closer look at a few of the dog foods the company offers and why you may want to try them out. It’s understandable why you may want to be conservative with the idea of giving treats to your dog, given the weight issues associated with them. But this Bil-Jac treat is an exception because it has been made to be savory yet low in calories. High up in the ingredient list is chicken liver followed by real chicken. Both ingredients make it a healthy treat that benefits muscle growth. A point of note is this treat is grain-free. So, if your little buddy has allergic reactions to grain products, this treat would be a good option. That’s not even all. The treats are designed in small chunky bits that allow your little buddy easy grasp when picking them off the bowl or feeding them from your hand. However, the treats may not be suitable for dogs that are allergic to chicken. All dog breeds, from the tiniest to the largest, are adorable. But there is something majestic about the sheer size and demeanor of a large breed. For such size, a healthy meal formulation that addresses your hound’s animal protein needs, in addition to calcium and carbs, is necessary. This Bil-Jac large breed formulation contains 25 pounds of real chicken that is used to make 30 pounds of dog food. The meal is packed with quality protein for maintaining optimal muscle mass. Carbs are catered for by slow-cooked oat and cornmeal, both of which double up as sources of dietary fiber for better digestion and healthy bowel movement. Bone strength for a large breed is absolutely crucial in order to comfortably support the size and weight of your large breed canine buddy. To take care of that, this formulation comes complete with a generous amount of glucosamine and chondroitin. Also, the balance between calcium and phosphorus in this recipe makes it ideal for large breeds because they are guaranteed a healthier skeletal frame. Also a worth a mention is the presence of omega-3 and -6 fatty acids, which work to maintain healthy skin and a luxurious coat for your hound. Based on Bil-Jac puppy food reviews submitted by customers on Chewy.com and other online stores, I have to admit Bil-Jac Little-Jacs is one of the few delicious and healthy treats you can get for your pup. In addition to being tasty they are meaty, such that just about any dog will find them irresistible. Top on the ingredient list is chicken liver and fresh chicken. Your pal’s taste buds will be tingling with joy at the taste of real meat in the treat. You will also be glad to know that all your worries about unwanted weight gain have been taken care of. Each Little-Jac contains not more than three calories. They also do not contain rendered fat, which is a crucial fact when it comes to a healthy dog treat that is mindful of weight management. 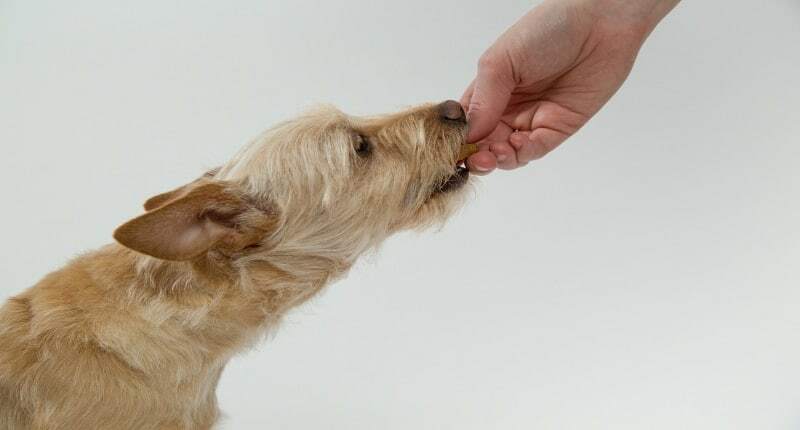 Whether you are using Little-Jacs to show affection to your pooch or as a reward system in your training program, your canine pal is likely to love their taste and you can be certain that they would not encourage unnecessary weight gain. If your pooch seems to be gaining more weight than is good for her, it would be great to get her on a diet that is flavorful but with reduced fat content. This will help your dog reduce excess weight or maintain an optimal weight. However, the problem with most reduced fat dog foods recipes is the lack of sumptuous flavors. Well, this recipe isn’t one of them. Imagine a recipe that contains 20 pounds of chicken in a 30-pound recipe. Quite interesting, right? What that means for this particular recipe is that although the fat has been reduced in the formulation, there is still plenty of chicken in it to remain flavorful. Chicken liver and organs add to the flavor in addition to being rich sources of arginine. Arginine is one of the amino acids that help in organ development and maintenance in your pooch. Energy for your pooch in this recipe is provided by corn and oatmeal, both of which are easily digestible carbs that have plenty of fiber and are essential to gut health. What’s more, your pooch is less likely to have constipation or stomach upsets with this dog food due to the inclusion of dried beet pulp, which contains naturally occurring prebiotics that improve digestion and absorption, in addition to promoting frequent bowel movement. If you are a parent to a small breed such as a Chihuahua or Yorkie, you will know that they have unique dietary needs that call for a balanced, nutritious diet tailored for a smaller body mass, mouth, and stomach. Bil-Jac Small Breed dry dog food hits all the right notes when served to your tiny buddy. This means it is tasty, balanced, and wholesome, and therefore able to address all nutritional aspects that a toy dog requires to thrive. Chicken, a primary source of animal protein, is the key ingredient that allows optimal muscle development. The size of your buddy should not fool you. She needs adequate energy to keep up with her active and playful nature. In order to take care of that, this recipe features slow-cooked oat and corn meal as well as sweet potatoes. You might wonder whether the process of slow-cooked ingredients makes a difference. It does! Slow cooking enables the carbs to be low glycemic, meaning that they keep the level of glucose in your pooches blood steady during and after meals. Besides providing plenty of energy to your canine pal, the carbs in this diet are highly digestible for a sensitive stomach. Also present are omega-3-and -6 fatty acids. Both allow your dog to have a healthy skin and rich fur. Unfortunately, this diet may not be ideal for gluten-sensitive dogs as the recipe contains oats and corn meal. Just because a brand is popular does not automatically mean that they are the best option for your dog. Admittedly, some make quality formulas that meet the needs and expectations of users. However, there’s also a good number of brands that fail to meet the most basic expectations of a pet parent. As mentioned earlier, Bil-Jac is a brand that is not heavily advertised, but when you take a closer look at their philosophy, it becomes clear that the company has your dog’s nutritional needs at heart. All the ingredients used are farm fresh, and as you’ve observed in all the Bil-Jac dog food reviews, there’s hardly a recipe where animal protein has been substituted by carbs. Well, this is one of the hallmarks of a high-quality dog food manufacturer. You can find Bil-Jac’s huge array of breed specific and numerous other dog formulations on leading online outlets such as chewy.com. Next article2019 Eukanuba Dog Food Review: Is It Worth The Hype [or Not]?